At Sheridan Larson Law Firm, Michael J. Sheridan and Steven K. Larson work together to provide comprehensive legal support for you and your family. Estate Planning/Probate: The appropriate allocation of your assets, plan for debts, and designation of health care wishes doesn’t have to be overwhelming when you have an experienced Arizona estate planning lawyer on your side. Divorce: Our goal is to minimize the stress, time, energy and costs for you so that you can complete the divorce process and obtain the resolution you are searching for through dissolution with an experienced Arizona divorce attorney. Child Custody/Legal Decision Making/Parenting Time: At Sheridan Larson Law Firm, we advocate for you and your loved ones. With an experienced Arizona Divorce attorney on your side, impossible situations can lead to satisfactory resolutions that benefit you and your children. Child Support: For assistance in obtaining child support modifications or help with child support arrearages, please get in touch with one of the experienced family law attorneys at Sheridan Larson Law Firm today. Personal Injury: Regardless of what type of personal injury you are dealing with: car accident, a dog bite, an accidental fall in a parking lot, a slip in a grocery store, etc., you should have an Arizona personal injury lawyer on your side. Guardianships & Conservatorships: If you find yourself in a situation that requires you to take over custody and property of another person, whether a child or incapacitated adult, discuss guardianship & conservatorships with an experienced attorney at Sheridan Larson Law Firm. 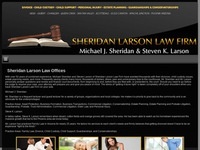 Please get in touch with Sheridan Larson Law Firm as soon as possible if you are in need of legal assistance.